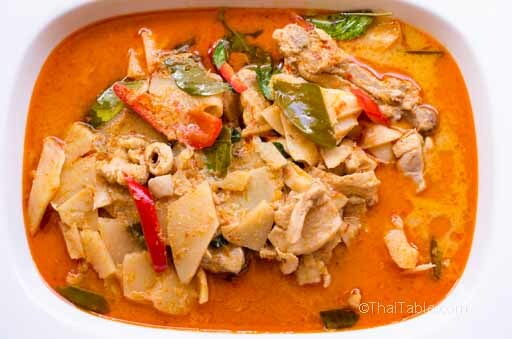 The secret of rich and flavorful sour bamboo curry is adding chicken bones and skin to the curry. 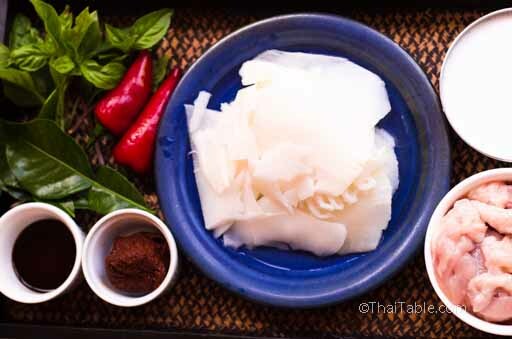 In this recipe, I add water because the hand squeezed coconut milk in Thailand is different than the canned one. We use the first squeeze to cook with the curry paste. The second and later squeeze which have less coconut oil are later in the process to make the volume. The red jalapenos are optional. In Thailand, we use prig chee fah, which is mild. You may find other mild peppers work better. The bright red from the peppers adds an appetizing appearance to the curry. Prior to adding fish sauce, taste your curry first. Some sour bamboo shoots can be quite salty. 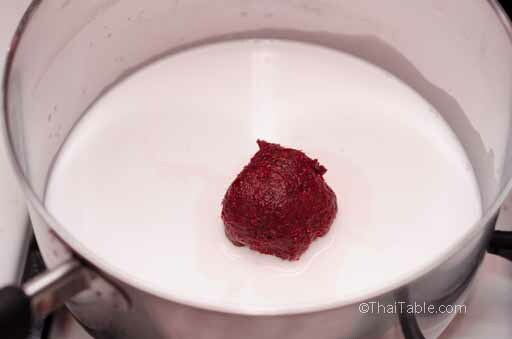 There is also a great amount of salt in the commercial red curry paste. Use the amounts in this recipe as a guide. 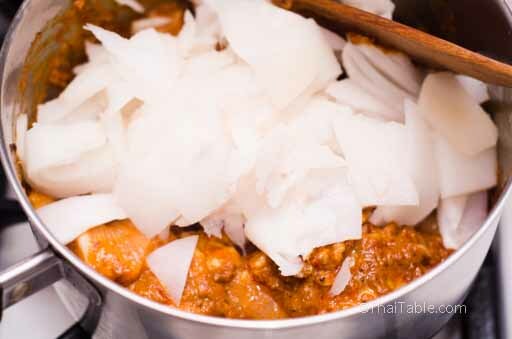 Curry recipes are generally flexible with the amounts of ingredients. When you first taste your curry, it may seem overly spicy hot. Over time, the curry gets milder. If your sour bamboo shoots are large pieces, cut them into bite sizes. Cut chicken into bite sizes as well. Wash and pick Thai basil. Slice peppers into thick strips and discard seeds and stems (picture 2). 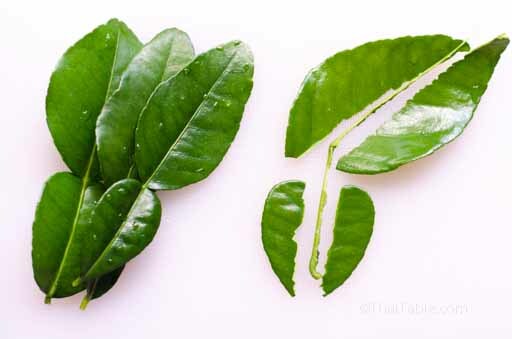 Strip kaffir lime leaves away from center stem (picture 3). 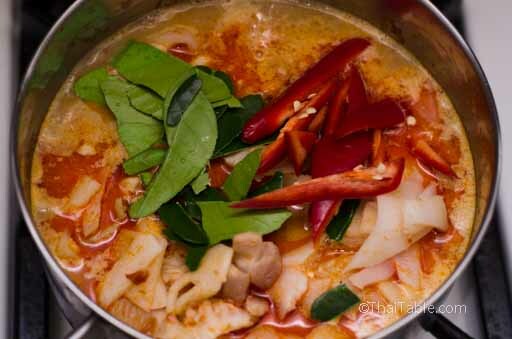 Over medium heat, in a 2-quart pot, add ¼ cup of the coconut milk and the red curry paste. Mix them well and keep stirring. After a few minutes, the mixture will thicken and red oil will bubble up. Keep stirring to prevent burning. You may need to lower the heat if the curry sauce splatters too much. 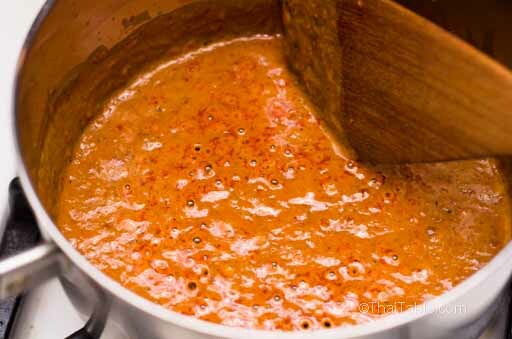 After you see red oil (picture 5 - click to see larger picture), add another ¼ cup of coconut milk. Stir to reduce the coconut milk again. 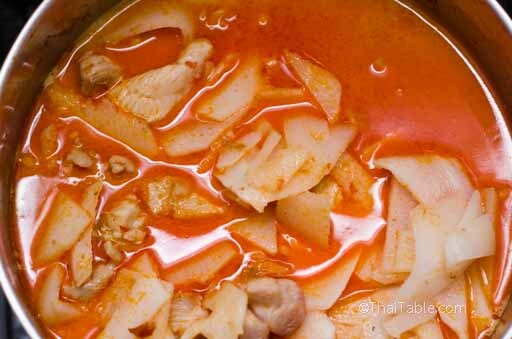 When you see red oil floating on top, add chicken and chicken bones (picture 6). 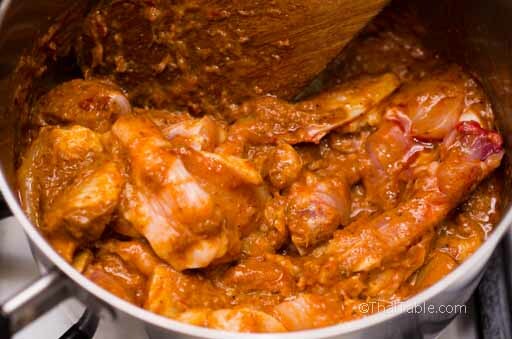 Stir to coat the chicken with the curry sauce (picture 7). Add the sour bamboo shoots. Stir and mix everything together. Add the rest of the coconut milk and 2 cups of water. You can use this 2 cups of water to clean out the can or container of the coconut milk. Turn up the heat to let the curry simmer. 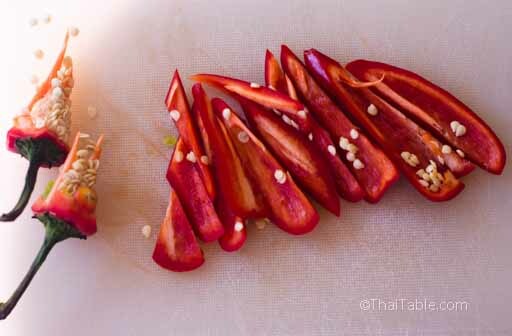 Add the sliced peppers and kaffir lime leaves (picture 10). Stir to mix everything in. Take a taste test. You may or may not need fish sauce. If you do, add the fish sauce here. Basil can and will turn dark from prolonged heating. Right before you serve this dish, heat the curry to simmering and turn off the heat. 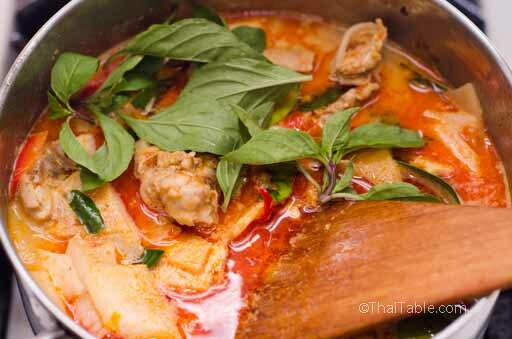 Add the Thai basil leaves (picture 11) and push all the leaves under the curry to keep the basil bright green. If you let the basil leaves sit on top of hot curry, the steam from the curry will brown the leaves. By submerging the basil leaves under hot curry, it keeps the basil green for the next 5 minutes.